This Quickstart demonstrates how to send Push Notifications to an Android application using Notify and Twilio Functions. When using the Notify service, you'll need to be able to register devices to receive notifications, and then send notifications to those devices. To get you going quickly, you can use Twilio Functions. You can also always write your own server code using any of Twilio's supported server side languages (Node.js, Python, Ruby, C#, Java, or PHP) - check out how to register bindings or how to send a notification in those languages. The sample mobile app is already set up to communicate with Twilio Functions to register a device for notifications. You just need to create two Functions in your account from a template, and then specify the URL for one of those Twilio Functions in the source code to the app. To get started with this, create a new Twilio Function on the Twilio Console's Manage Functions page. 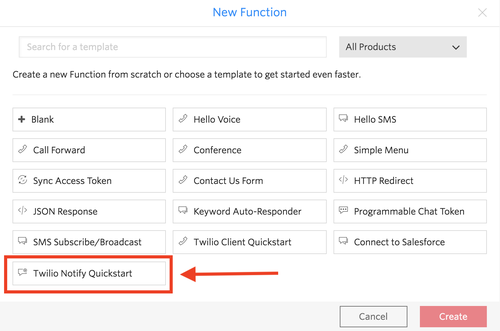 Choose the Twilio Notify Quickstart template from the list of templates. 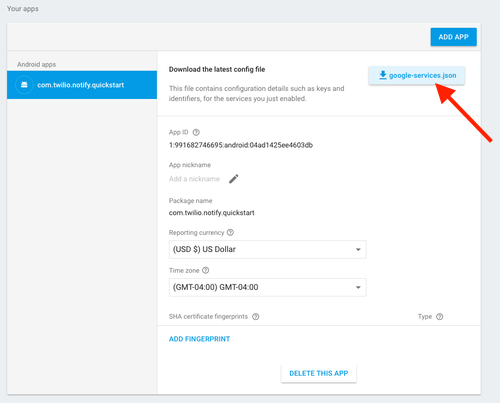 After choosing the Twilio Notify Quickstart template, you'll be asked for one piece of configuration information - the Notification Service instance SID that you created at the beginning of this quickstart. After entering that SID as the value, and clicking create, you will see two new Twilio Functions on your Functions page. The first function is Register Binding - available at the /register-binding path. The quickstart mobile app sends an identity and the device token that it gets from the Firebase Cloud Messaging service to this function to create a binding. Notify uses these bindings to map the device that someone is using to their identity when you send a notification. The second function is Send Notification - this is available at the /send-notification path. The mobile app does not use this function - instead you can use it to send notifications to yourself on the quickstart app. If you select either function, you can see the Node.js source code, if you are curious to see how these are implemented. Now that you have the Twilio Functions created, it's time to set up the Android app! Next, go to Firebase Console to generate a 'google-services.json' file for your app. Download google-services.json file and save it to the /app folder. This file configures your app to receive notifications via FCM. Next, in the notifyapi/TwilioFunctionsAPI.java file on this line: private final static String BASE_SERVER_URL = "YOUR_TWILIO_FUNCTIONS_URL"; replace the string with the address of your server. To send a notification, you can use the Twilio Notify Quickstart (Send Notification) Twilio Function you just created. You can either send an HTTP GET or an HTTP POST request to the function. Typically, you would send a POST request to the function from your application (as you are performing an action, not retrieving information). If you don't have an easy way to POST a request (like Postman or curl), using GET is fine for testing your quickstart app. Use the identity you used in the app. 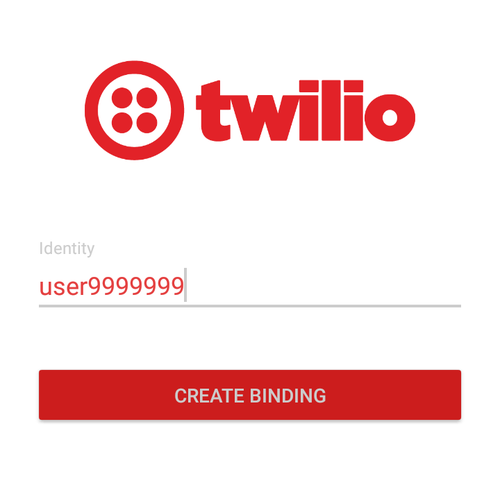 Because you registered a binding with Twilio, the server will send your device the 'Hello' message as a notification.